It is Trisomy 18 Awareness month. Those with Trisomy 18 have a third copy of chromosome 18. Thus on 3/18 we celebrate, and the month of March is designated as a time to learn about these precious little ones. I hope to impart some understanding of Trisomy 18. There are innumerable myths perpetuated about these sweet children. Ideas have consequences. In this post I will address the labels placed on these babies that can fuel life-altering outcomes. This dehumanizing phrase is a label that is still being used in medical textbooks today. One time we met with a group of medical students who had the opportunity to learn about Melody. I asked them if they knew what Trisomy 18 was, and they confidently replied, “Oh, yes.” When I asked what they had learned about it, they were a bit sheepish. One young lady reluctantly responded, “That they are incompatible with life.” How tragic. All that these ambitious medical students could be proactively learning and researching about these sweet children is supplanted instead with this demeaning term. This label has had lethal consequences for countless babies. One example of this is: I am Not a Syndrome, My Name is Simon. 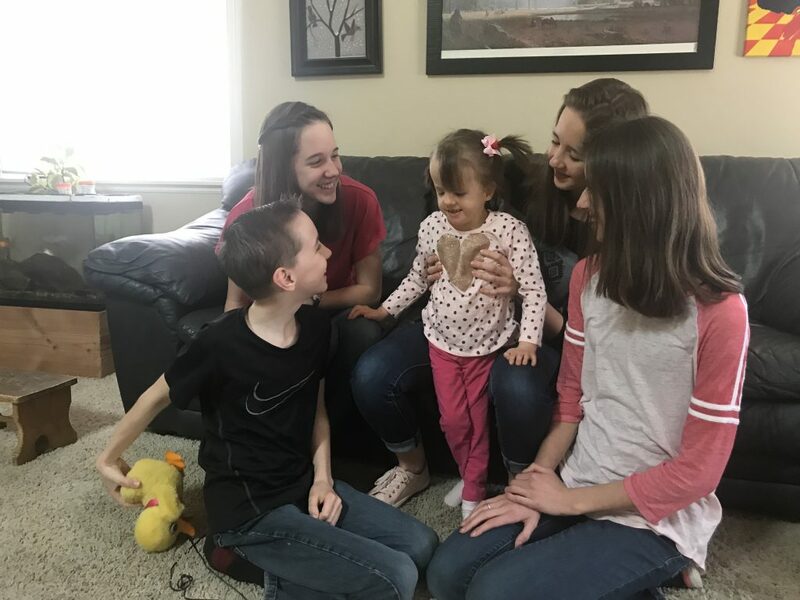 Truth: Children with Trisomy 18 are indeed more vulnerable and can certainly have medical issues, but that does not make them “incompatible with life”. Every life is a gift and should be treasured as such. 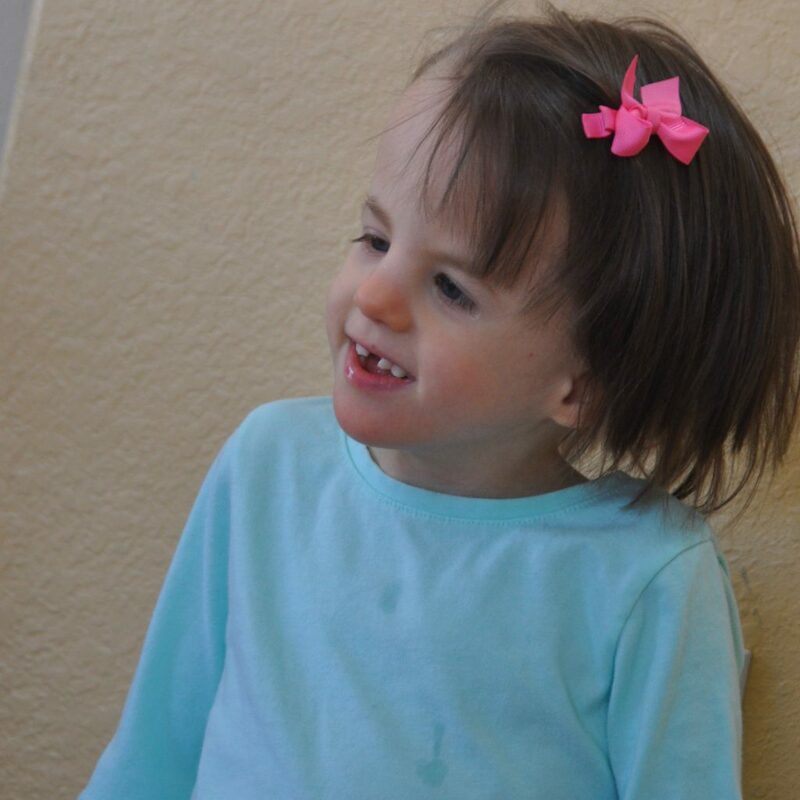 Children with Trisomy 18 are not perfect, but who is? They present challenges, but who does not? They may have extensive needs, but does that make them any less human? Myth #2: These children will be “non-contributing members to society”. It is my understanding that this degrading phrase is used quite commonly when these little ones are in the womb. The pressure to end their lives is immense. Truth: That is a slippery slope. On what basis should people be determining who is a “contributing member of society”? The truth is Melody has contributed more to our lives than I could ever articulate. Myth #3: These children will be utterly miserable. 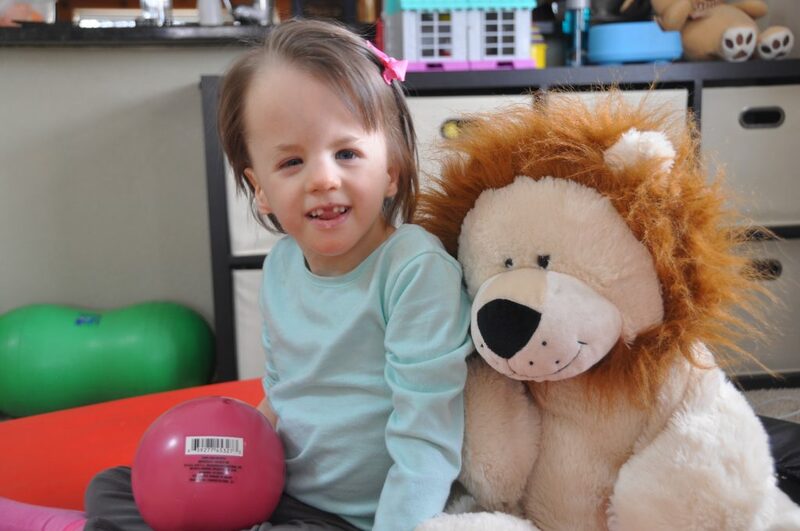 When Lila was born (Trisomy 18, age 6) her family was told that she should be taken home on hospice. If she lived she would be a vegetable, she would not know who her parents were, and that she would always be miserable. Truth: The assessment Lila’s family received about what their little girl’s life would be like is not uncommon. These statements are unsubstantiated. Yes, these little ones have challenges in their development. However, they are individuals who achieve milestones in their own timing. Lila is a happy little girl who certainly knows who her parents are. Melody also defies every one of those assessments. To call Melody a vegetable would be ludicrous. She might be a little nut (i.e. playful, quite silly, and has the cutest sense of humor), but a vegetable she is not! She is very engaged, knows exactly who we are and what we represent to her, and communicates what she wants quite competently. As for the description of “miserable”, that would be the antithesis of Melody. One evening a few years ago Melody’s dad looked down at her while holding her at the dinner table and commented, “You have such a good life.” It is true. Melody is so sweet, happy, and lovable. She does not suffer in any way, has no stress, and does not understand evil in the world. To say that she has a good life is actually quite an understatement. Incidentally, even if she were to suffer in some way, that would not make her disposable. We treasure every day with our sweet little gift. 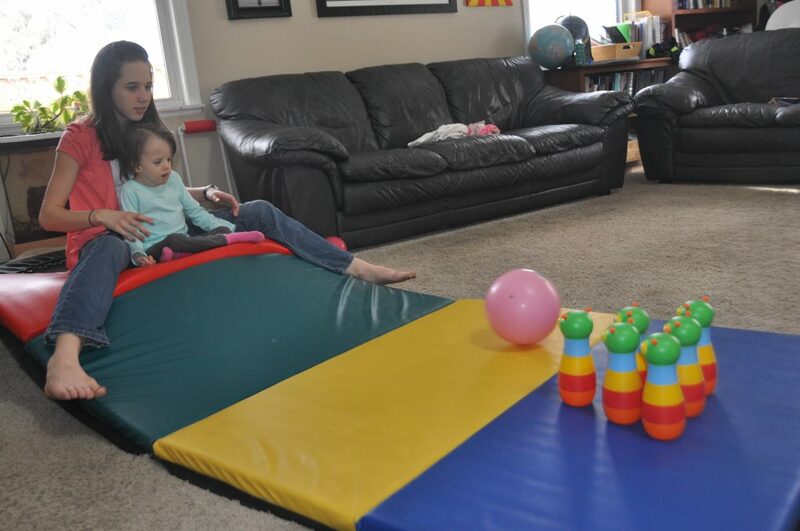 Melody’s brother engineered a system for Melody so she could roll a ball downhill and knock out the bowling pins. 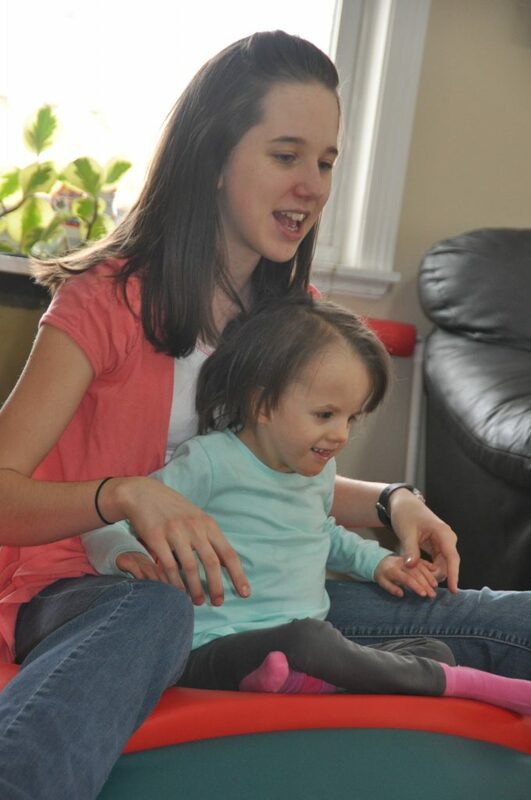 She and her sister had enjoyable time together as Melody demonstrated her impressive skills. After a few rounds of bowling her daddy taught her how to slide down her mats. 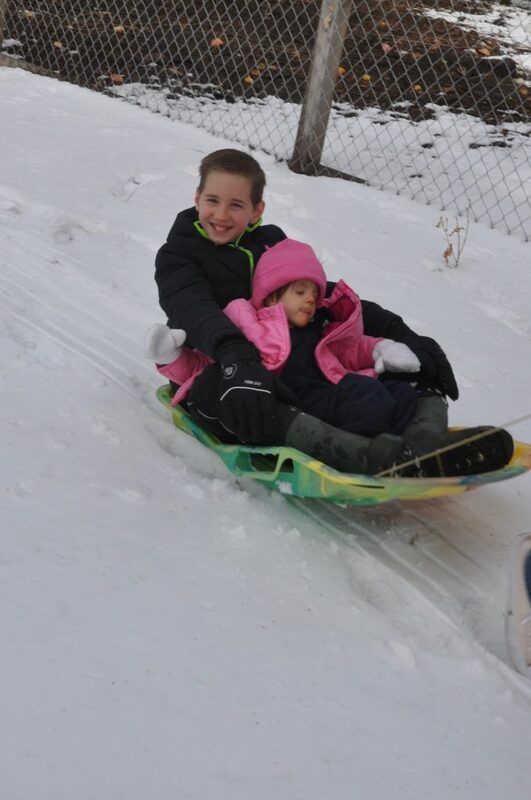 She clearly communicated to him that she wanted to keep sliding. 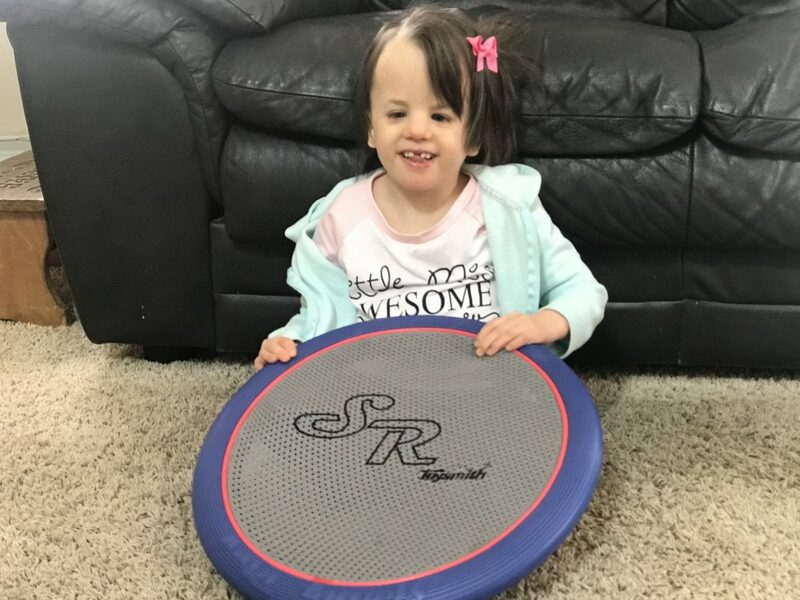 Melody is all smiles when her brother plays with her. She adores him. 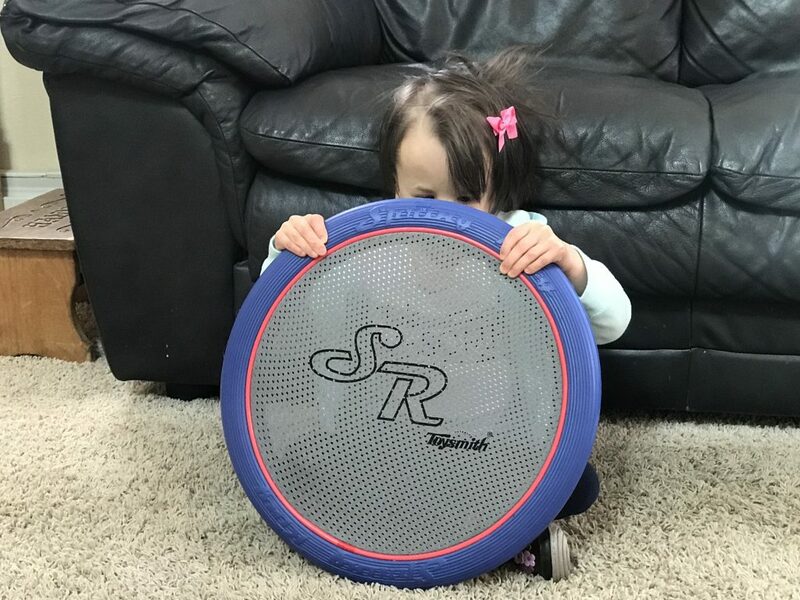 She has figured out how to shield herself from the ball her brother tosses her direction. Being little in stature is not always a disadvantage. She is actually quite talented at this game and thinks her brother is especially funny. He can elicit laughter from her like no one else. Let us begin sowing accurate thoughts and ideas on Trisomy 18 and change countless destinies. We must stop dehumanizing, devaluing, and pressuring parents to rid our world of those who are not “perfect”. Trisomy 18 babies are some of the sweetest children you will ever meet. Happy Trisomy 18 Day from Little Miss Melody! 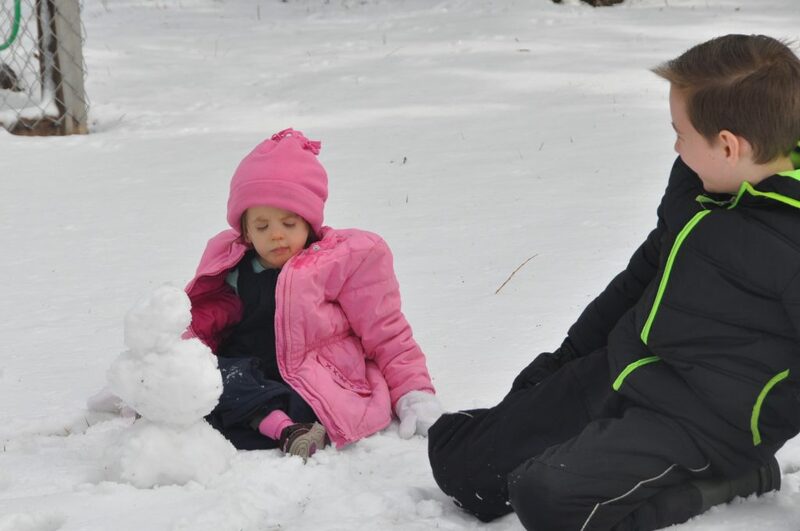 Melody’s brother made her a miniature snowman after a big snowstorm. She wasn’t so sure about this. 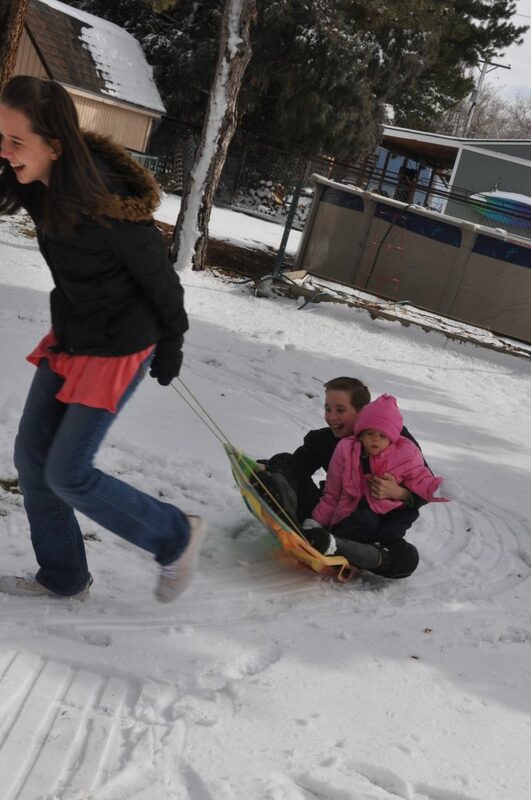 Not sure how much fun Melody is having here, but her siblings sure are enjoying themselves. What a wonderful blog, full of truths, and myths that are mistakenly thought to be truths. Melody is a lesson for all of us and I am grateful for your continuing to teach us. I feel so fortunate to be a part of her incredible story and being able to continue to see her life and your family’s lives unfold in such beautiful ways. Very well written. Thank you for writing this! Blessings to sweet Melody and family. What a joy to see her growing and having soooo much fun! I am grateful for your sharing and for being able to see her changes,,,She has lost some teeth! My life is certainly enriched for knowing all of you and I thank you. What a travesty that a person’s worth is decided before s/he is given a chance! 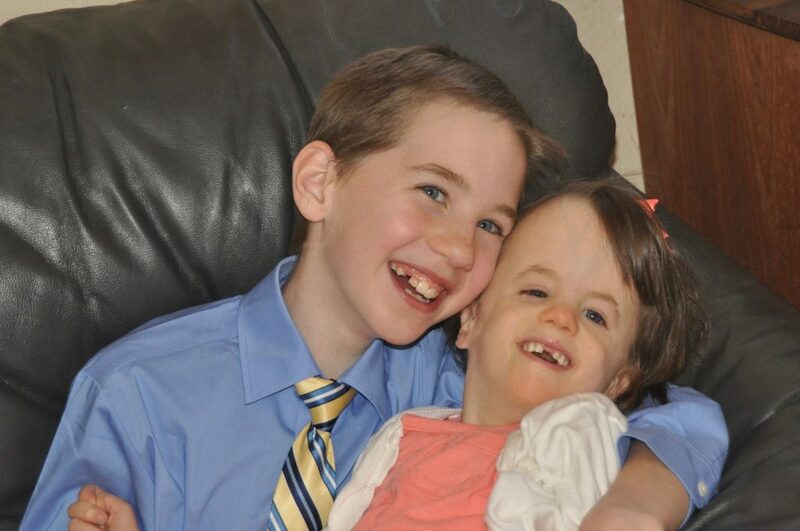 Thanks, Melody and family, for continuing to show the world that where there is love, there is hope. Thank you for sharing Melody’s and your family’s story. You made my day! Her smile is infectious and she truly is ‘the Little engine that could’.